Adding a bookcase pinboard helped my home office function in a new way. 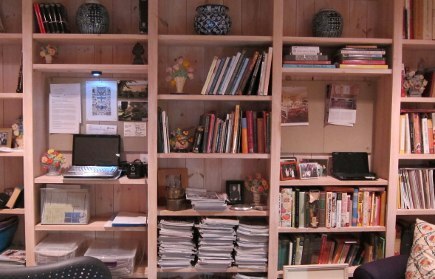 With so much information online these days I find need less space for books and magazines but more for display and utility. 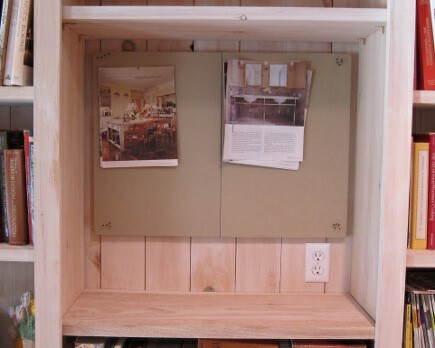 So when my friend Jewel, who helped me with my Kitchen Picture Wall, also suggested replacing the framed Indian rubbings in my bookcase niches with a pair of high-utility pinboards, it made perfect sense. I could get rid of all the desk clutter by pinning it up and and — biggest plus of all — create a super accessible space for my laptop. Some people work on a desktop with two or even three screens. That would give me ADD – but having my laptop handy for my scanning is perfect and it’s easy to use while standing at the bookcase. My office bookcase looked different before we lived in the house full time. It didn’t need to be as efficient — more decorative was fine. The bookcase niches are relatively small – 30” x 28.” Pottery Barn Modular Linen Pinboards, which come in pairs, looked like a perfect fit. I don’t normally shop at PB but I caught a 15% off sale with free shipping. 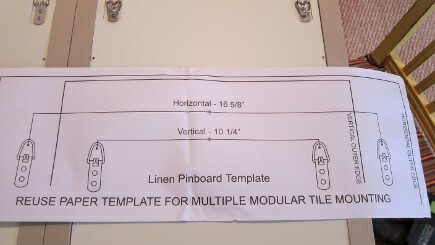 The pinboards are clever. They come with D-rings pre-installed in two directions so they can be assembled to hang horizontally or vertically. 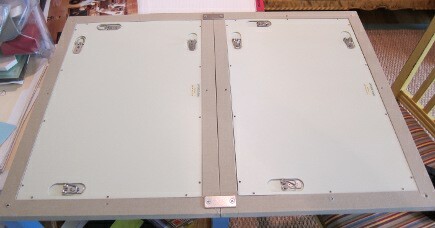 A paper template with both options is included with each board along with the necessary screws and braces. Plus the backs are predrill ed so the hardware goes on easily. One pair, joined vertically, was a perfect fit in each niche. 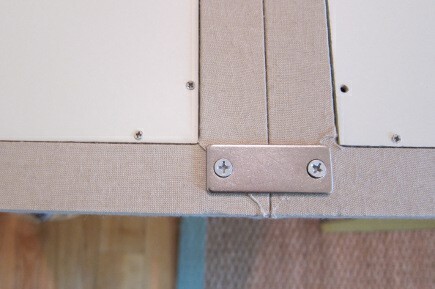 It took minutes to tape up the templates side-by-side and hammer in small picture hooks. Catching the hooks on the D-rings was a bit of a challenge in the confined space so I taped down the unused rings. 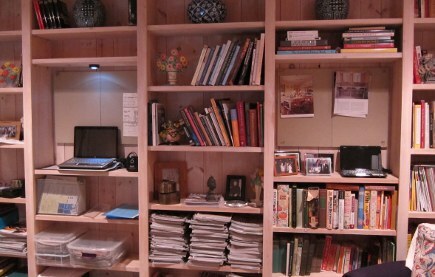 Once in place, I had ample space for real-life pinning, plus room for my laptops on the shelves. When using the laptop at night I found I needed some overhead light. I always have one or two extra stick-up LED pucks on hand for use inside closets – another easy solution. 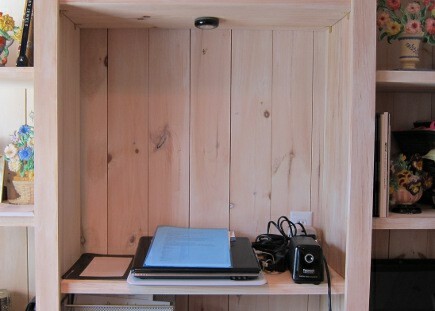 Now I can stand and scan photos easily, or send a quick email without disturbing my desktop screen. Plus, I still have a space to display family photos and the cast iron flower basket doorstops that keep color in my space all year long. 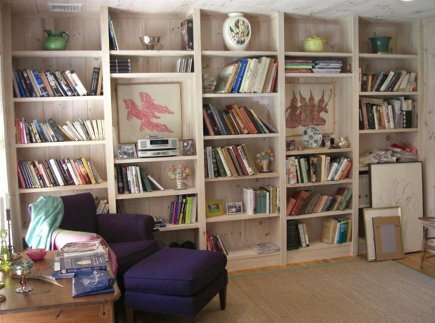 I would love to have enough wall space to have all those bookcases. I really like those pin boards too. You are too clever by far :-). Great use of space! Not half clever enough as it took me so long to think of this! This is so wonderful. I’m totally jealous of your pin board!